The Durban Exhibition Centre offers five convention halls of various sizes and capacities which can be used for all manner of event types ranging from exhibitions and conferences to weddings and banquets. The largest venue, Hall 1, offers an area of 6,000m² of flexible event space, and when combined with the adjacent Hall 2 by means of operable walls, our clients can enjoy over 9,200m² of flexible event space. The combined venue is large enough to accommodate a plenary audience of over 8,000 delegates or a banquet for over 4,000 guests. Hall 2 itself offers over 3,000m² of column-free exhibition space and may be utilised as a single venue or divided into three separate areas. In addition to an organiser’s office and a VIP suite, the venue provides a gallery comprising four booths for media or private use. The DEC also offers smaller multi-purpose venues alongside the main convention halls, consisting of Coast of Dreams, Mystrals and Hall 6, which are perfect for meetings and break-away sessions as well as cocktail functions and banquets. 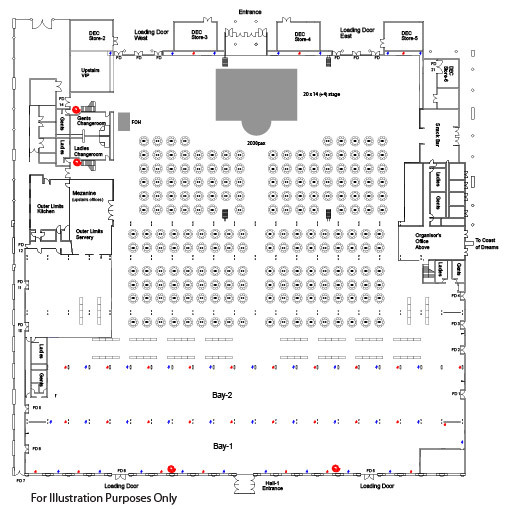 The DEC also provides open plazas on either side of the main halls which serve as loading docks on the same level as the convention halls, making it a breeze for build-up and break-down of exhibition stands.